One of the real estate trends here in New Hampshire is rehabbing old cabins and cottages on the big lakes and turning them into luxurious all-season getaways. Working with a designer, you can retain the rustic summer camp feel with today’s comforts, whatever your personal style may be. Is the foundation sturdy and stable? Are walls free of dry rot, insect damage or pest infestation? How will you insulate and heat the home? Can the service panel accommodate today’s electricity demands? The answers to these questions will tell you and your designer/builder whether your project is a teardown, gut job, or major renovation. (If you have enough property, you might also consider rehabbing the camp as a guest house and build your dream year-round vacation home next door. Old granite stone foundations are classic, but is the mortar crumbling, or has the cabin settled, leaving cracks? Shoring up an insufficient foundation—especially with today’s demands for multiple bathrooms, or another story above—is critical. And any addition needs its own foundation. If you’re expanding the footprint, you’ll need a current survey showing property lines and a run through the local planning and zoning department. Changes in layout present their own challenges. Plumbing will need to be added and/or rerouted. The same with the wiring and electrical panel, which will need to be replaced to accommodate today’s household power demands. This includes adding more than the ancient standard of one outlet per room. One of the “charms” of old cottages is discovering that rubber insulation has been chewed off wires, or that there’s aluminum wiring—a hazard. A fun find: pulling out pages from a 70-year-old Sears catalog or newspaper that had been used as insulation in the walls. That rickety porch that’s starting to sag from wood rot can last ages longer if rebuilt with highly durable decking made of composite material that never needs painting or waterproofing. Wrap-around porches fan out to include multiple-level decking with a water feature, hot tub, patio, fire pit and outdoor barbecue big enough to handle a pig roast. Maybe with a wood-fired pizza oven on the side. Now you have three-season living and entertaining space outdoors. Do you really want to fuss with maintaining a lawn? Instead, make the most of natural features such as glacial boulders, ferny groves, and consider care-free xeriscaping. Presto! You have your weekend back for boating, hunting, skiing, entertaining or just plain escaping. Any re-design calls for new windows. For year-round comfort, replace inefficient and drafty single panes with well-insulated double- or triple-pane Energy-Star rated ones. (Newer designs are not only more energy efficient, they’re easy to pop in and out for cleaning. “Up and out” are the watchwords for transforming a chalet, cottage, A-frame or beachy bungalow into a mountain or seaside showplace. Gone are low ceilings and postage-stamp decks or balconies. Beamed ceilings soar, second stories top a single story, with maybe a loft above that. Make the heat a treat! A wood stove or wood-stove insert gives the glow, heats more efficiently, and can be loaded at night to burn unattended until morning. But pellet stoves look like wood stoves, without the hassle of splitting, hauling, stacking and storing wood. In the luxury market, air conditioning is standard, even on a breezy lakefront; on humid nights you’ll appreciate it. But at minimum, ceiling fans move cool and heated air, directing it up or down according to the temperature outside. A simple and effective way to complete the classy cabin or luxury lodge look is with colors: weathered barn red or rust, matte sage to forest greens, mahogany, or dusty gray/blue. Popular metals are copper and pewter, or black wrought iron. Wood is a natural throughout, whether in warm honey tones, rustic redwood, or gleaming polished golds; big timbers or classic logs, wood is good! Picture blacksmith-style hardware on a sliding barn door, or a forest green metal roof. Wood, stone and nature’s colors (a green roof or trim) also help integrate your second home into the landscape. You can have your heated towel racks and sauna while still honoring the original purpose of the property and the integrity of the old cabin. Complementary architectural elements can “echo” gables, timber style and size, or a farmer’s porch. Repurpose weathered boards or siding to preserve the truly rustic look and feel where you want it. Another way to honor the home’s heritage is with artifacts. A couple ideas would be to create a shadow box with great-grandfather’s fishing lures and hat; mount canoe paddles, skis, or rod and reel over the doorway, or hang a fishing tackle basket on a wall. One thing you won’t miss when transforming a family cabin into an all-year getaway: the smell of mildew or musty walls. Talk to the experts at 3W design, inc. about making your summer place and all-season getaway space. You’ll have all the comforts of home and go from camping to “glamping” in style. It’s decided. You love where you live, and you want to stay a long time, so you’re going to tackle a major home renovation. All you can think about is the completed result and you can’t wait to start the project! Now pause. Before you write the first check, think about this: should you stay, or should you go during the work? Demolition and construction cause lots of dust. Even if the renovation is closed off with a plastic zip tent and has its own air handler or filter (highly recommended), anyone coming and going will track fine dust on their shoes. Plus, the dust released every time the area is opened hangs in the air for a long time. If anyone in the home has lung or breathing issues such as asthma or chronic obstructive pulmonary disease (COPD), the decision is already made for you: You really need to move out during construction. Other reasons to plan for a temporary rental or sharing a home with friends or family include installing a new roof or another floor, if baths are being remodeled, or when more than half the house is being done (such as after a disaster like a fire). Having a baby or toddlers is enough reason too, as are pets, for safety reasons. After creating a comprehensive plan with you, your contractor coordinates everything: arranging for permits, debris removal (picture a Dumpster in your front yard), subcontractors including licensed plumbers and electricians, material deliveries, construction and inspections. Because of so many factors, any estimate is subject to change. A kitchen remodel consisting of a full gut and moving/installing plumbing or electrical, could take six to eight weeks. If you decide to stay, there’s a lot to think about. Can you relocate the fridge and set up a kitchen in the garage? It depends on the season, and if the builder needs that space to measure, cut and saw. But be careful what surface you have the appliances on. Unlike kitchen counters and a stove top, your dining room table’s hand-rubbed finish can’t stand the heat. Fire up the grill and eat outside when feasible. Use paper plates and disposable cups whenever practical, but you’ll still need access to a sink for washing—maybe a laundry sink? Got kids? Make it fun! When it feels as if the kitchen job is dragging on too long, make it a challenge to eat at or get takeout from a different ethnic restaurant each night for a week: Italian, Chinese, Indian, Thai, Mexican, French, Japanese, etc. You may discover a new favorite! Or, hit a diner and have breakfast for dinner once a week. Chances are the kids aren’t as wigged out as you are over the construction chaos. If we’ve learned nothing else from HGTV, it’s “expect surprises.” Those surprises usually have a price tag accompanying them, and virtually always add extra time to the job. So, if you’re redoing your living or great room and/or expanding your kitchen and formal dining room for a milestone anniversary party or small wedding, leave a couple of months “wiggle room” in the contracting schedule. When the dining room of one 1765 colonial was opened to fix water damage from an upstairs bath, the contractor discovered the whole wall was rotted from foundation to rafters. Faced with an unexpected cost, remind yourself that you’re remodeling because this is your home and you hope to live there a long time. A delightful surprise in an antique farmhouse was discovering stone walls behind the drywall in a bathroom redo. They were left exposed for a unique shower enclosure. Plan to avoid scope creep. Beware of “scope creep” and yes, we’re talking to you, the client. Homeowners are notorious for changing plans, adding items that aren’t on the original plan of work, and then wondering why the job comes in late and over budget. To circumvent this, be prepared to spend plenty of time with 3W design’s team before a single work truck pulls up. For example, you may have your heart set on a Mexican tile, but if it’s back ordered, you may be asked to select something else you like that’s available sooner. Once it’s in, typically early in the process, plumbing and electrical can’t be moved “a little to the left” or fixtures changed without delaying everything else—and incurring extra cost. Remember the before-during-and-after’s—photos, that is. We like “during” the project pictures to document the progress and provide some architectural history of your home. In a few months you’ll be enjoying your addition, new bathroom or kitchen so much that you’ll forget what it used to look like and wonder how you got along without it. Waking up in the remodeled home you love is one of the most wonderful gifts you can give to yourself and your family. What Colors Are You Living Today? We live in a world of color, which has the power to lift our mood, express ourselves, brand our lifestyle and even tell us whether we’re celebrating or commemorating. It’s part of our vocabulary: he’s feeling blue, she turned red, blushing pink with pride, purple with anger and so on. “When 80% of human experience is filtered through the eyes, we understand that the choice of color is critical,” according to the authority on colors, the Pantone Color Institute (www.pantone.com). Executive Director of the Pantone Color Institute Leatrice Eiseman describes Pantone 18-3838 as, “A dramatically provocative and thoughtful purple shade,” which communicates “originality, ingenuity, and visionary thinking,” Eiseman says. Founded in 1962, Pantone created the Pantone Matching System (PMS), ensuring consistency of color in printing ink, paint and fabrics. Along the way the company made predicting color trends into an artful science, forecasting and influencing what color dresses, appliances, even cars we’ll be seeing, and creating brand palettes for clients based on color psychology. Color is universal. Recognize any of these? What do they make you think of? Now picture the institutional green of old hospitals and prisons, and battleship gray. What is color – really? It starts with light, which is made up of waves of electromagnetic radiation on a spectrum. It was Isaac Newton who discovered that focusing light through a prism broke the waves up into separate colors: the seven colors of the rainbow. Of course, he didn’t think of them as waves, but each color is a different wavelength, with violet being the shortest at 380 nanometers. According to Eiseman, Ultra Violet is complex because purple is a blend of colors from the opposite ends of the spectrum. Red is a warm color, and blue is on the cool end of the spectrum. What’s important is how you want to feel in that room. If you’ve ever stared at the bewildering array of 2X2 sample chips in a paint department, you know how frustrating finding the right color can be. That’s where 3W design, inc. can help. Nurseries and kids’ rooms have run the gamut, from baby blue and rose pink to gender-neutral sunny or butterscotch yellow, to primal primaries. Chalkboard paint comes in assorted colors now, so kids can show their true colors. Dark typically conveys drama. Chocolate brown had its day; recent saturated colors have included aubergine (the expensive name for eggplant) or cobalt blue. Think twice before rolling an entire room in one of these colors—try an accent wall first. Houzz.com warns that yellow can be “tricky.” Though you may love it on that paint chip, on the wall it may be too intense. The pros at Houzz recommend selecting a hue that’s almost beige; it will look much brighter on the wall. Can you picture your traditional home with ultra violet walls? Maybe not. But as an accent color alongside other jewel tones (magenta, emerald) in fringed silk drapes, it could make for a dramatic late-Victorian parlor. Thinking spring? For that fresh-as-a-daisy look, consider a spring palette of green (perhaps the 2017 Pantone Color of the Year, Greenery) and white, with a splash of pink or rose, and/or daffodil yellow. Just as there are people with an ear for music and those who are tone deaf, some people have an eye for color and others do not. And just as with music, harmony is key. That’s why working with a design professional when building, remodeling and decorating can make all the difference. Crisp white trim is always in style, for example. But some palettes—khaki and browns– are better suited to off-white with a splash of cream. A cool gray palette needs trim with the slightest dusting of gray. It makes a difference. Best of all, with paint there’s no fear of commitment. If you made a mistake, or when it’s time for a change, you just paint over it! Though one person’s puce is another person’s carmine, there’s one thing everyone can agree on: life would be awfully dull without colors! 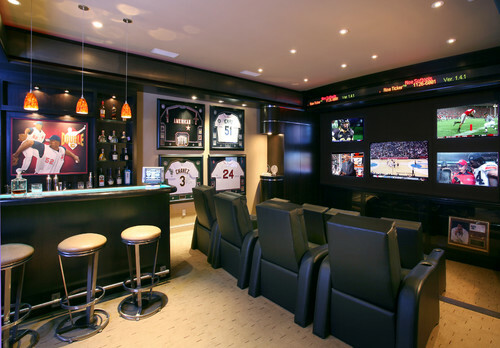 If you’re male and don’t yet have one, you want one: a man cave. Elevated in form and function from the old-fashioned snooze-worthy den, a man cave is an all-out expression of a masculine territory grab, and woe betides the woman who tries to put her stamp on it. In fact, according to psychologist Sam Gosling of the University of Texas, having your own space is psychologically healthy, perhaps especially for guys. “Space is very important,” Gosling told Houzz editor Mitchell Parker, as a “powerful mechanism for evoking our emotions.” That affects emotional well-being. Since most homes are decorated by women, and guys wisely defer, the “man of the house” is usually conditioned to live in a feminine influenced space and will go along. Hence, lots of men feel the need for making their own mark with a man cave, whether in the basement, garage or loft. A vinyl weight bench, big-screen TV, dorm syle mini-fridge and shelf of dusty trophies in the basement does not make for a legitimate man cave. Think broader and bigger, based specifically around typically masculine interests. Picture a theme that resonates with you? Compared with its female counterpart, which tends to be a quiet space, a man cave is meant to be shared, where nobody’s “shushed” and guys can get rowdy. You’ll need to equip it for entertaining. The benefits of building your “no girls allowed” space in a garage include bigger toys: ATVs, motorcycles (and an extra engine or two for parts), racing bikes, tools mounted on the wall. A half bath or one with a shower is helpful if you’ll be lifting more than 12-packs in your home gym, or tinkering with engines in your shop. While you’re configuring extra plumbing, what about a sauna? Okay boys, so what’s your pleasure? If you need inspiration, take a spin online at Houzz, HGTV or Pinterest for more inspiration. You can even find a Little Rascals’ “He-Man Woman Haters Club” sign, should you desire one! Because most of the home is typically her province, the female equivalent of a private space is often a quiet retreat or sacred space, not a place to party with pals. 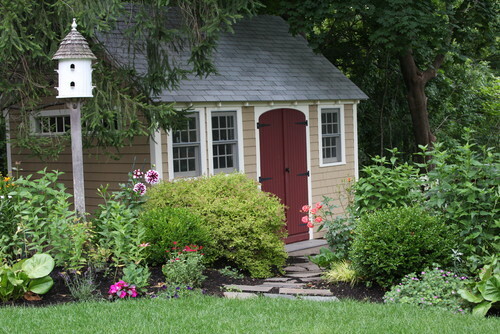 Consider the “she shed,” which quite literally gets her out of the house into the backyard. Bigger than a gazebo, smaller than a guesthouse (though that would make a great hideout), a she shed can be a greenhouse or cottage-style shed (with windows of course), or a grown-up dollhouse. You may desire a potting table for plants or an art studio; with a couch for lazy afternoon naps. They can also be craft spaces for pottery or maybe you’re into natural fibers and knitting. House Beautiful once featured a crystal chandelier for a she shed that included tea lights for lighting the space. Practically speaking, in Northern New England, a separate space away from the house may not make the most sense, unless you have an old farmhouse with an undercover ell all the way. If your she shed isn’t insulated and electrified, it will only be a seasonal retreat. Welcome the comeback of the Victorian parlor or sitting room. Today’s home design is big on “open concept,” but older homes were broken up into smaller spaces according to function. The parlor is where you received guests and held formal events, and a sitting room was where women gathered to read or converse; it often functioned as a sewing room. Many of today’s homes have cozy rooms or nooks without doors that can be easily transformed into an “estrogen room,” as one musician friend dubbed hers. It contains her piano, CD player, a loveseat, books including her devotional reading, a family photo wall, and is decorated around a tea and florals theme—delightfully girly. Fitted with French or pocket doors for privacy, a parlor can be an island of serenity within the home, where you can read, dream, craft, do yoga, play music, meditate, whatever your heart desires. Dreaming of a special place in your home to call your own? Stop dreaming and start planning. 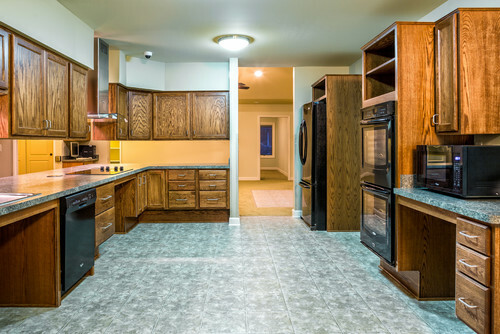 The design/build team at 3W design, inc. can make that space a reality – for him and for her! Want to know just how to decorate for the holidays? It’s always easier when you go with your own style and preferences. So, what’s your style: country cabin chic with plaid or burlap ribbon, holly and winterberries, a cranberry and popcorn garland? How about elegant Victorian, with mercury glass ornaments, velvet or lace ribbons, pearl or beaded garlands, candle lights on the tree? Maybe you’re a trendsetter with a fuchsia or neon turquoise color scheme with silver accents and sophisticated silhouettes. Your holiday home can express themes of your personality and aesthetic, whether contemporary or old-fashioned, or something in-between. Do you love nature and wildlife? Winter outdoors has a certain mystique as illustrated with scarlet cardinals, chickadees, reindeer, turkeys, snow hares and though far from New England, polar bears. For the Dickensian look and feel, heirloom or reproduction Victorian cards or illustrations, vintage trees or light-up villages, horse-drawn sleighs can bring a classic Christmas to life. Creches or nativity scenes are centuries old and the tradition of displaying village scenes started in the mid-1800s, and having trains circling the tree began later that century as toy trains were introduced. Some of your favorite collections can be incorporated into holiday décor, whether menorahs, angels, snowflakes, gingerbread figures, Father Christmas, or nutcrackers. But they don’t have to be holiday-related. Seashells, tea cups, cast-iron banks can find a way to be included in your collection for a one-of-a-kind display. A traditional homespun Christmas includes bulky knit stockings hung by the fire, hand-strung garlands of cranberries, popcorn and wooden beads or thread spools, pine boughs and garland studded with pinecones. Or consider a sophisticated style that shimmers with mirror and gold, silver or mercury glass accessories, with a pop of frosted icy blue for accent. Scandinavian holiday décor is elegant in its simplicity, with sparkling snowflakes, glowing tapers, slender birch branches – nothing too fussy about it. Appropriate to the Festival of Lights, Hanukkah celebrations feature lots of candles (besides the ones in the menorah), and shiny blue, silver and gold (for gelt). Think glow, glam and sparkle with glitter and foils. Mixing the metallic is no problem. We don’t advise mixing themes & styles—at least not in the same room. But you could have a formal tree in the living room or parlor and a kids’ tree in the family or great room featuring their decorations, construction paper chains, candy canes and handmade ornaments shedding gobs of glitter. Or put a nature-themed tree on a porch or three-season room. Fireplaces are focal points, especially in the winter. When designing your mantel display, include items of varying height for interest (paperwhite amaryllis, tall branches or candlesticks). If you have ornamental andirons, brass or black wrought iron for example, pick up the color of the finish in your tableau. Appeal to all the senses: from fresh pine boughs to fragrant candles, cinnamon and clove cider simmering on the stove, and of course, the music of the season. A memorable scent (like that of evergreens) and favorite carols can transport you and your guests to times gone by. Don’t forget the sense of touch. Even a winter white color scheme can come to life with a variety of textures, from satin to feathers to fur and nubby-knit throws or pillows. Part of the fun of the holidays is surprises – from gifts to guests. Include the unexpected to delight family and friends with a whimsical vignette in a powder room, along a staircase, or on a windowsill. Attach sleigh bells to an old ski or snowshoe for the front door. Plop a Santa hat or antlers on that bronze bust or statue. Most of all, enjoy the holidays. If you feel overwhelmed by the thought hauling out dozens of boxes of decorations, just focus on one thing, such as the tree, or a mantelpiece. Then resolve to go through the bins some stormy Saturday, and give away what you no longer use. Remember, nothing must be perfect—just perfectly you. All of us at 3W design wish you and yours a warm, wonderful holiday season filled with the joy of family and friends. Chilly enough for you yet? The first snow has already fallen but what about the temperature inside your house? Nothing says, “Welcome home” in New England more than a cozy feeling of warmth when you enter. But at what cost? Whether oil, gas, electric, wood or solar, weigh the cost efficiency of the fuel you use and the heating system, not just when building or remodeling but over the lifetime of your home. Beyond the efficiency of the heating system, when building or doing major renovation (or turning a seasonal vacation home into a year-round getaway), consider the envelope first; that is, how well-insulated and air-tight your house is. What exposure do your windows have, and how many panes? Next, how is the heat distributed through the home: forced air, steam or hot water radiators, radiant heat in the floors, zone heating in each room? There’s another type of distribution, called natural air flow, letting heat from a single source (a woodstove or solar elements) flow through the rooms. Of course, the layout needs to be conducive to this kind of heat conduction and distribution. According to www.green-energy-efficient-homes.com, most North American homes have forced-air heating. This means the heat (or air conditioning) is distributed through ducts. When incorporated into your home’s design, you can benefit from the sun’s heat without having solar panels through “passive solar” means. Basically, it’s using appropriate materials that soak up the sun and release its to warm you, and designing floors, walls and openings to make the most of it such as tile floors that warm up in the winter but feel cool in the summer and window coverings that provide insulation. See https://energy.gov/energysaver/passive-solar-home-design for more. Exterior solar panels warm up liquid or air that then travels throughout the house. This is typically supplemented with another stand-by heat source and/or radiant heating. Many antique homes are heated by hot water or steam traveling through metal radiators, which can be noisy and inefficient. Some may like the nostalgia and want to preserve or upgrade these units. Hey, it’s your money! Wood is an age-old source of heat in New England and is considered “carbon neutral” because you’re not burning fossil fuel. Today you can burn wood in an efficient woodstove or fireplace insert. Pellet stoves are another way to burn this age-old renewable fuel very efficiently. The look and smell of a yule log on the fire speaks of the holidays but you may be screaming when you see the heating bill. You can have a “tight” house and a top-notch heating system, but if you use your fireplace as is, you lose a lot of heat up the chimney. Think about a woodstove insert: you can still enjoy the dancing flames, but you get more bang for your buck in terms of heat output (BTUs). Otherwise, with an open hearth, you are literally sending heat up in smoke. Remember from science class, heat rises? That’s the idea behind radiant in-floor heating. Imagine stepping out of bed and onto to warm wood or tile floor. Heat distribution is more efficient because the heat from the warm flooring goes up, warming the living space as it goes. This is much more efficient than mini-splits—a form of zone heating with a device in each room–which releases heat near the ceiling. For toasty tootsies, radiant heat under the flooring is the way to go—unless you have carpet, which blocks the heat. So, consider this when building new or putting on an addition (especially in the bathroom, where it can feel absolutely decadent). If all these choices have you wondering about your heating system, look for its Energy Star rating. Go to www.nhsaves.com for more on choosing efficient and environmentally friendly fuel and heat sources. And check the website of your utility to see about an energy audit. Eversource, Liberty Utilities, New Hampshire Electric Co-Op and Unitil can help determine how your current home rates and suggest solutions such as weatherization to improve energy efficiency. There may even be rebates available. So how cozy is your home? With a digital thermostat, it depends on the time of day. Programmable thermostats let you set a temperature so that your bedroom cools down overnight, using less heat, and warms up as the sun comes up. Traveling for the holidays? It’s worry free when you can set the temperature low enough to keep from wasting heat while you’re gone; high enough to prevent frozen pipes. The design and construction professionals at 3W design, inc. know the ins and outs of every type of heating system and whether new construction, an addition or renovation, we’ll work with you to ensure your home’s temperature–and utility bills–are comfortable year-round. Imagine this: you get out of your side of the bed, which has been individually programmed to be at the perfect temperature for you all night. As your feet touch the floor, the coffee pot starts. Meanwhile, 5 minutes before your dawn-simulating alarm clock began to light up the room, radiant heating turned on to warm the bathroom floor. These features and many more are making homes smarter, safer and more carefree to live in. What makes a home “smart?” Smart refers to systems being connected to the Internet, wirelessly integrated into the house and accessed and controlled remotely by computer, tablet or phone. According to the 2016 Houzz Smart Home Study, the top two smart products people invest in are security/safety systems and thermostats. Going down the list is entertainment, climate (HVAC), and lighting upgrades. Integrated into your home’s “hub,” smart systems can listen, conserve energy, increase your family’s safety, and prevent disasters such as flooding from burst pipes in the winter if the power goes out. Greater ease of living for disabled people and the elderly with voice-controlled or motion-sensing technology. So, what’s your home’s IQ? High efficiency, long-lasting (up to 22 years) light bulbs are typically one of the first items people choose when they decide to go smart. Digital thermostats with timers can be programmed to lower the temperature while you’re out all day and bump it up to a more comfortable level when you get home. But now you can adjust the temp at will from your office. Remember The Jetsons TV show? It took a long time—55 years since the show debuted in 1962—but we now have robot housekeepers (Roomba), video watches (Apple Watch), and a talking virtual assistant: Siri, Amazon Echo, Google Home. From entertainment remote controls to garage door openers to programmable thermostats, you already have devices with some “smarts” built in. Products that take intelligence to the next level include appliances such as refrigerators that can tell you when you’ve run out of something. A Bosch model, for example, has an interior camera that can send a photo to your phone so you can see what you need to pick up when you’re at the grocery store. More sophisticated hubs have switches or touchpads that disappear into the wall, and make it easier to integrate technology as it becomes available. Back to bed: Luna makes a mattress cover that fits over your current bed with sensors linked to other devices and was featured recently in www.PCMag.com. Luna’s smart technology—like a television that “learns” what shows you like—learns your typical bedtime, temperature preference, and tracks your heart and respiration as you sleep. Luna co-founders Matteo Franceschetti and Massimo Andreasi Bassi created it based on what they call “If this, then that” technology, or IFTTT, a website and app. So when the mattress cover “realizes” (senses) you got up, commands you’ve given it kick in: the coffee maker, for example. So, want to teach your old house some new tricks? A remodeling or renovation is the perfect time. The design/build professionals at 3W design, inc. can help you integrate the latest in smart-home technology seamlessly and beautifully into your home. Ask us how! Inclusion means being welcoming to all. But how welcoming is your home? If a family member or guest is in a wheelchair, would he or she have ease of access? Will the house suit you well into the future as you “age in place,” that is, as you grow older and your needs change? Unless brand-new and designed to Americans with Disabilities Act (ADA) specifications, it probably isn’t. Impaired vision and diminished mobility happen to many of us as we age, and a traumatic injury can occur any moment. So, if you’re designing a new home, remodeling or retrofitting an older one, it makes sense to prepare for the future with features of “universal” design. Sometimes referred to as barrier-free design, the idea behind universal design is to make places more accessible to all. But this doesn’t have to mean an institutional look with grab bars and ramps! Attractive, engaging design suitable for all ages and stages of life and health can be as unobtrusive as wider, more welcoming doorways, and using contrasting colors to differentiate subtle changes in floor levels or edges of countertops. Our old Granite State is facing a “silver tsunami” as Baby Boomers grow older and fewer young people remain to start families. According to the NH Center for Public Policy Studies, by 2030 one-third of the population (almost half a million of us) will be 65+. So, while it’s not yet every man or woman for himself, remaining independent in our homes is important in the Live Free or Die state. Replace all remaining incandescent bulbs with LED ones as needed. LED bulbs last much longer, are more efficient, and save money. Examine lighting overall, including outside along paths and at entryways. More is better for both residents and guests. Install motion-sensor lights at entrances. Is your street number well-lit and easily visible for visitors and emergency services? As you replace appliances, think long-term: sit front-loading washers and dryers atop storage pedestals for less back bending; get a dishwasher with pull-out drawers; a range with controls that are front and center (with safety locks for the grandchildren). Keep it on the level! This goes for deck or patio access too. Anywhere you can provide access without adding steps can pay dividends down the road. Plan a bedroom and bathroom suite on the first floor. Widen doorways (looks more welcoming too), and work with your designer to eliminate or minimize a change in floor levels on each story. Use drawer-type pulls instead of knobs on cabinets and drawers, and swap out doorknobs for push-down handles, to make it easier for arthritic hands. Install brighter and more lighting, and more outlets to prevent the need for cords stretched across the floor. Put outlets higher up on the wall for ease of access. Kitchen remodel? Have counters and cabinets installed at the right heights for more control over you’re your cooking areas as well as cleaning up. 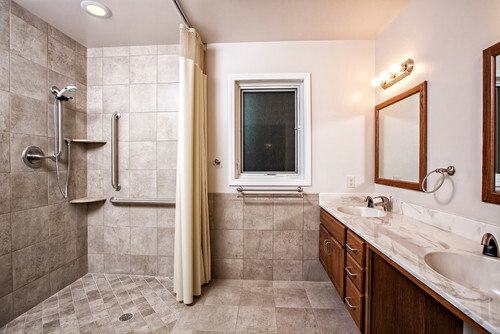 Install a walk-in shower or tub with nonskid surface and flooring, and ergonomically placed grab bars (in décor color instead of metal) and a seat. Use antiscald valves and include a handheld showerhead. Remember when the “space-age home” of The Jetsons TV cartoon? Baby Boomers do. Today’s wireless technology makes much of that a reality. Having your home connected through the Internet, you’re your mobile device allows you to check on the security of your residence and turn on lighting or heat from anywhere so your home environment is ready for you the moment you arrive. And, it can also be a lifesaver, enabling you to check in with an elderly parent—and allow a senior or disabled adult to summon help at the push of a button or with a word command. Things we now take for granted, such as remote-controlled power garage-door openers, were once considered assistive technology, so power up! Build in remote controls for lighting, heat and cooling. Add intercoms to avoid getting up or busting your vocal chords to communicate from different rooms. Do you love where you live and plan to stay awhile? Create a home that’s warm and welcoming well into the future without sacrificing style or beautiful design. We’re proud to be a Certified Aging in Place Specialist (CAPS) as designated by the National Association of Home Builders (NAHB). 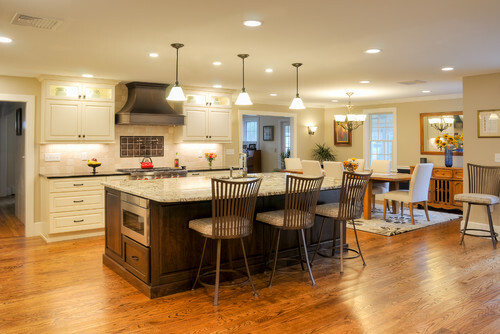 You can feel confident working with your 3W design, inc. professional to remodel a home that you’ll love no matter what your age or circumstance. You’ll always look forward to coming home and have a more welcoming space to accommodate all your family and friends. Designing for your dog or cat? Well, sort of. Think of it as more of a lifestyle choice. Pets add so much to our lives. Some might say that a house isn’t a home without the pitter-patter of paws. You may be balancing kids and pets, or perhaps your adult children have left the nest. Whether remodeling, new construction or designing a second home, why not make things as comfortable and easy-care as possible for you and your critters. Let’s concentrate on cats and dogs since they are the most popular housemates. Start from the bottom up. What flooring surface works best for your lifestyle and animal companions? Carpeting is quiet and comfy but if your precious is a Persian, be prepared to purchase a heavy-duty vacuum. The best defense may be matching the carpet color to the fur color. Stainmaster has a line of PetProtect Carpet with guarantees against pet stains, though that won’t help with shedding. Hardwood or laminate floors are noisier, which may be a consideration if you have a large breed dog. Marmaduke’s claws may also scratch softer floors, such as pine, and lesser quality laminates. Hardwood stairs are slippery for furry feet, so add a carpet runner or treads (sisal hides a lot of dirt and is easy for paws to grip). A great strategy when planning for pets (especially larger ones or multiples) is dedicating space at an entrance such as a mudroom. Tile or heavy-duty vinyl flooring is easy to mop clean of muddy paw prints and stray kitty litter. Hang hooks for towels, collars and leashes, and have a basket for pet toys. Having a sink or dog-washing station is even better. Paint the walls or wainscoting with washable paint (at minimum a satin or eggshell finish, not flat) and wipe down at least seasonally. When Rufus shakes or Bernie the Saint Bernard drools, you’ll be glad you used semi-gloss. Shelving units like those to organize closets are an attractive way to store pet shampoo, brushes, dog sweaters, etc. Can you slide a litter box underneath? Of course, regular grooming including clipping nails, washing, combing and brushing can go a long way toward keeping your pooch, feline and your home clean! Pet odors come from fur or hair, and skin oils. Anything you can do to keep Fido or Fluffy clean means a cleaner home and furniture for your family. If you’re going to let furry friends on the couch (as if you can keep them off! ), you need upholstery that’s forgiving of sharp claws, hair and fur. Made to be moisture-, stain- and odor-resistant materials that are easy care include canvas or “duck”-type fabrics, and indoor/outdoor materials such as Sunbrella or Crypton. A lint roller in the coffee or end table drawer may be your second-best friend for quick clean-ups. Quality leather or Pleather is a good choice if your buddy doesn’t have long claws and won’t use the sofa as a scratching post (provide an alternative, like a cat condo, for climbing and scratching). But it does age over time, gets scratches and discolored from the oils in an animal’s coat or skin. Rambo the Rottie may be persuaded to adopt a corner of the couch if you keep a favorite blanket or throw to nest in on top of the upholstery. Ever notice how cats and dogs move from place to place throughout the day to nap? If you provide more than one perch or bed, you have a better chance of keeping them off the wing chair. Pet lovers have even designed end tables with cozy crates underneath, and wall units and bookshelves incorporating a den-like cubby for Cujo. Window dressing is another important consideration. If your kitty is a climber, cross floor-to-ceiling silk drapes off your wish list. Roman shades are a better option and you can dress them up with a swag or valance. Cats jump up, and a Dalmatian or Lab’s tail can swipe a table clean in an instant, so place any fragile accessories behind glass in a display case. A basement or “rec” room is an ideal roughhousing place for children and pets. Leave lots of open space and put a carpet or rug down. If your pet is older or if you have puppies or kittens, consider “tiling” the floor with individual carpet squares, which can be replaced as needed. Whether coarse or wiry hair, kitten soft fur or short-haired coat or however our pets are dressed, we love ’em! Ask the animal lovers at 3W Design how you can welcome them into your home with style and comfort.